There are three graveyards in Paris where one might go for a spot of post-mortem celebrity spotting: Montparnasse, Pere-Lachaise and Montmartre. And it’s not as miserable an activity as it might initially appear. Among the millions of tourists who visit the granite who’s whos of Parisian history, you’ll find Jim Morrison fans, Oscar Wilde enthusiasts, history buffs, art experts and more. For commemorated in the city’s great cemeteries are a whole host of household names (Chopin, Piaf, Beckett, Baudelaire, Stendhal, Degas to name but a few). Of course the memorials for some of these globally-renowned luminaries are sufficiently opulent: towers of stone, glimmering angels, tombs bigger than student accommodation. But one stands out to me as being the most peaceful. Last time I visited La Cimetiere de Montparnasse I passed by a couple, pointing at this particular tomb, incredulous. 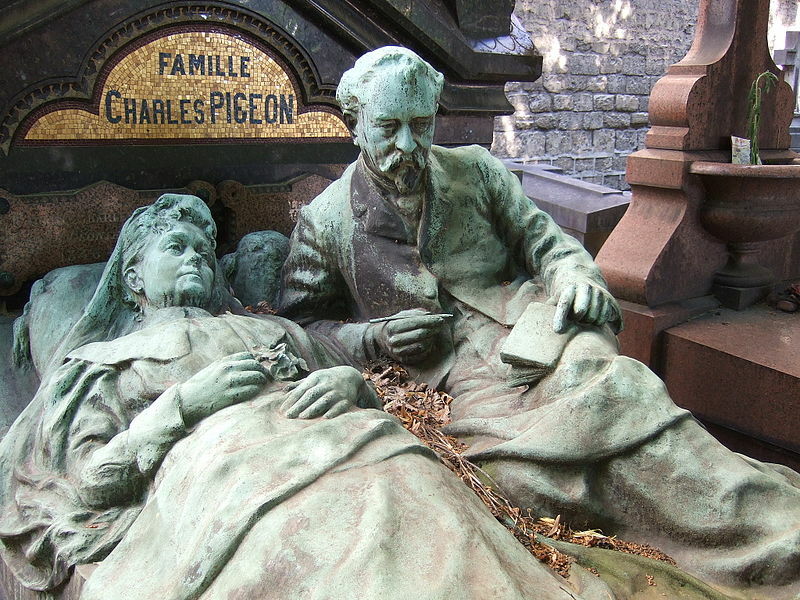 One of them asked the other, “Mais c’est qui Charles Pigeon?” Who is Charles Pigeon? Good question. The tomb I’m talking about is the current (and final) residence of inventor and businessman Charles Joseph Pigeon and it is as lovely as such an object can be. Designed to represent a comfortable double bed, sculptures of Charles and his wife lie beneath bronze bedsheets as though they’ve just woken to the Sunday morning birdsong around them. Madame Pigeon holds a flower while Monsieur has a loose grip on a pen and notebook. The tomb itself was designed to accommodate 18 members of the Pigeon family and is one of the most eye-catching in the city. Above the bed stands an angel, watching over the couple forever amen. But who were the Pigeon Family? Well, Charles Pigeon started his career as a salesman, specialising in the maintenance and repair of lamps. In the late 19th-century, he invented the exotically-named Pigeon Lamp, the world’s first non-explosive gasoline lamp. The Pigeon Lamp was presented at the 1900 Grande Exposition to enormous support and in 1902 Charles opened a factory on rue Montgolfier that produced 8 million lamps a year. He used his subsequent wealth to ensure his unique tribute to his family and had the tombstone designed and constructed 10 years before his death in 1915. If you’re interested in paying a visit to the very relaxed M. et Mme Pigeon, you’ll find them in the 22nd Section of the 22nd Division of the cemetery. Closest entrance is at 3 Boulevard Edgar Quinet, near to Raspail Metro station.